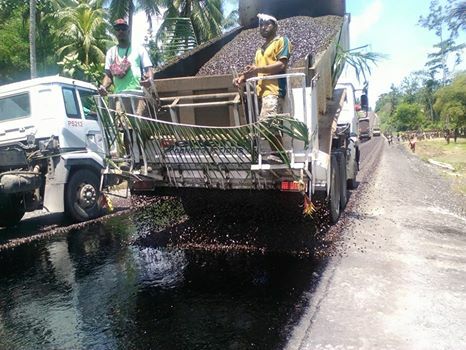 The final leg of the 57km section of the Highway from Malalaua to Epo in Kerema, Gulf Province was fully sealed and completed for use last week. Dekenai Construction Limited Project Manager Mr Jimmy Taparu was so happy to see the project being fully constructed despite many failed projects in the past and is looking forward to complete the last 11km from Epo to Kerema Town to fully complete the project. The K57km project was joint funded by World Bank of K90million and took almost 3 years to complete all construction works. Mr Taparu also raised concerns that the gulf Provincial Government must now look at upgrading feeder roads to allow easy access to the main highway by people living in remote parts of the Province. “Better road networks gives way for better developments down to the village level,” he said. The final leg sealing of the highway saw people celebrating in traditional singsings and dances as a sign of approval that they have been waiting for such impact projects for a very long time and this was the first they have received. A local from the Iwantu village, Mr Manu Kuma said they use to walk for 2 days from their village to the main highway and to Kerema to do business and seeing the completion of the sealing recently, gives hope for change to his people from the Mountain villages of Gulf Province. He also said in the past most of their people walk down to Kerema Town and elsewhere along the coast to catch boats and dinghies to come to Port Moresby, which many have lost their lives travelling the rough seas, but this will now be a thing of the past because they can now catch PMV straight to Port Moresby after the sealing of the highway. Meanwhile, a village leader of Ward 13 of the Central Kerema LLG Mr Moiu Koaru added that with this new road network, the Government must now look at boosting Economic Development Projects in Gulf like the new Fisheries Project recently launched which will allow for people to do business locally. Mr. Koaru commended Dekenai Construction Limited for a job well done and he is calling on Gulf people to take ownership of the already completed project and utilise it for more developments in the future. “The Gulf Technical Services have been slack in putting up impact project developments in the Province and I am calling on the National Government to intervene and make a change following the final sealing of this very vital project,” he said.